Thanksgiving is a national holiday that centers on a special celebration dinner feast of classic American cuisine. The traditional menu is uniquely American and is a particular combination of offerings that seldom occurs at any other time - turkey, dressing, cranberry salad, sweet potatoes, pumpkin pie... Even the main course of turkey is rarely featured at any other time during the year. The dinner is based on the original Pilgrim harvest dinner which did not include wine as part of their menu, hence wine selection is based on the modern day food and wine pairing. It is no surprise that the wine tasting selections to accompany the once a year Thanksgiving meal always offers an adventurous wine selection challenge. The characteristics of turkey and stuffing lends themselves to more neutral, low acidity, non-tannic, clean and crisp fruit filled flavorful wines. Suggested offerings tend towards white wines such as Sauvignon Blanc, Semillon or a more outgoing forward varietal such as a Riesling or a spicy Gewurztraminer. For red wine lovers, fruit filled moderate bodied earthy spicy reds go well with the dark turkey meat, sweet potatoes and stuffing, robust fruit centered wines, lighter and more moderate to accompany the more delicate neutral white meat. Finally, there is always a place for Champagne, especially on festive holidays, and most suitably with the white meats, hor d'ovres, appetizers and cheeses. We started the wine course with the cheese course pairing .. a sweet 'sticky' accompaniment to compliment the course of artisan cheeses - smoked Gouda, Bellavitano, berry infused goat cheese, and Regianno, with a selection of olives, peppers and pickles. The Sémillon is a full bodied, heavy, low acidity grape that when held on the vine to full ripeness results in high sugar sweetness for thick syrupy almost oily textured dessert wines that have long aging potential. They are great for sipping with cheese, chocolates, salads or hearty cake desserts. Along with Sauvignon blanc and Muscadelle, Sémillon is one of only three approved white wine varieties in the Bordeaux region that is also popular in Australia. The grape is also key to the production of sweet wines such as Sauternes or in this case, Barossa Valley botrytis semillon. Great accompaniment to the cheese course - apricot colored, full bodied, thick unctuous syrupy sweet nectar of ripe apricot papaya lychee fruit, accented by almond nut with a layer of smoke on the finish. Part of our holiday tradition is to serve authentic Champagne as part of the celebration of Thanksgiving for all the blessings that we recognize and for which we give thanks on this day. Of course authentic refers to the fact that only wine produced in the méthode champenoise sourced from grapes from the French Champagne region in northwest France is legally and appropriately labeled Champagne. 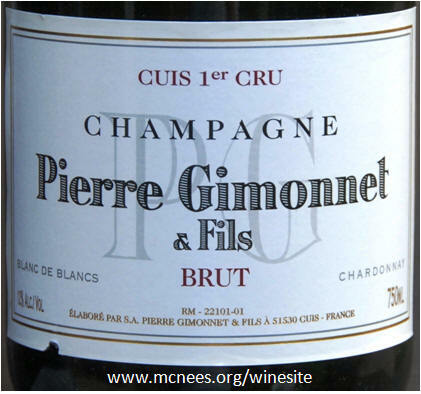 Like last year, this 1st Cru Champagne is part of a case we acquired several years ago. Sourced from anywhere else, bubbly is simply 'sparkling wine'. We visited Champagne during our Champagne Wine Experience 2006. Ryan brought this classic Châteauneuf-du-Pape (CDP) for our celebration dinner. CDP is the wine growing appellation in the southern Rhone River valley in the area between the towns or Orange and Avignon in southeast France, up river, north of Marseille and Aix-en-Provence. The CDP appellation rules that control the wines allow for up to thirteen different grape varietals in the blend which typically feature Grenache, Syrah, Cinsault, Mouvedre and are full, complex, gamy, earthy and spicy. 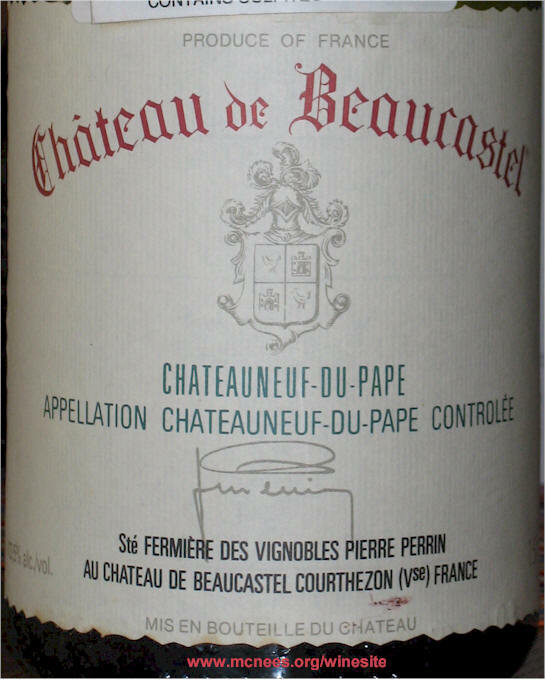 We've collected Chateau Beaucastel going all the way back the 1978 vintage. Our visit to Château Beaucastel was one the highlights of our visit to the southern Rhone River wine region including Châteauneuf-du-Pape in 1998. The wine evolved over the course of the afternoon and only after an hour or so did it start to open and reveal its native character and style. Dark brownish garnet colored, medium bodied, complex dark berry and spicy black cherry fruits were muted initially but opened up after an hour, accented by pain grillé (toast), smoke, leather, with hints of creosote and licorice on a moderate tannin lingering finish. 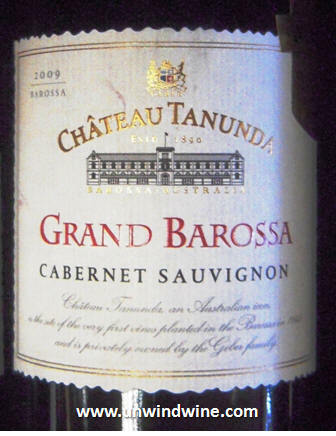 Translucent bright ruby color, light medium body, dusty rose with dark cherry fruit accented by brown spices, hints of black tea and tobacco leaf on a nicely balanced modest tannin finish. 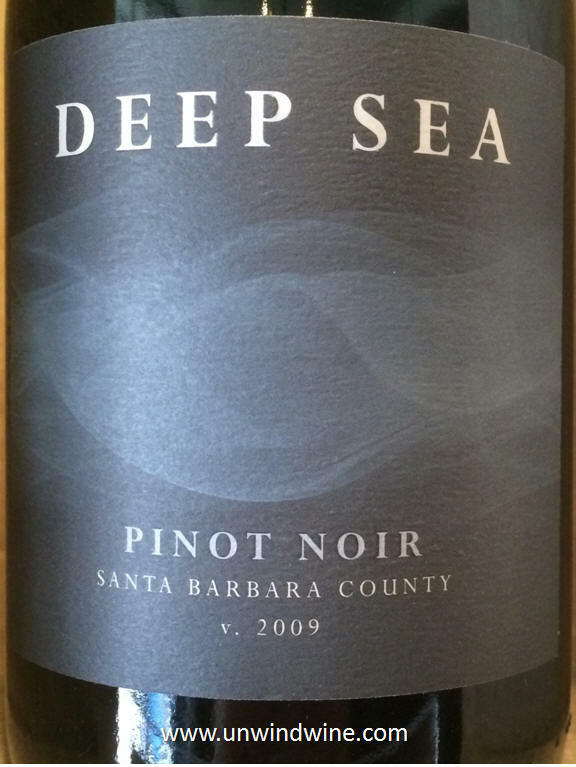 Dark ruby colored, medium to full bodied, bright forward blackberry and blackcurrant fruits with spice, hints of vanilla and oak on a long with fine-grained tannin finish.